Linguine is a form of pasta that is wider than spaghetti, but thinner than fettuccine. This Italian pasta is usually made with seafood or pesto and is usually available in flour and whole wheat versions . I like to cook linguine pasta with clams or prawns, so this recipe that I cooked, photographed and had as well is made with prawns (it was REALLY good so had to blog it right away!). I like cooking this dish on busy days, as it takes less than 20 minutes to prepare and cook this meal. It’s one of these recipes where the end results looks like there was so much effort put into this, but in fact, it’s super easy and quick. The total is £3.20 which works out as £1.60 ($2) per portion. *Prices are calculated from one of UK supermarkets website, prices are approximate just to give you an idea. This encourages me to cook at home more often, as it means not only that I can save A LOT of money instead of eating out, but I also know what’s exactly in my food! Fresh home cooked food is the best, isn’t it? Ever since I got myself an Instant Pot, I’ve been obsessed with it. 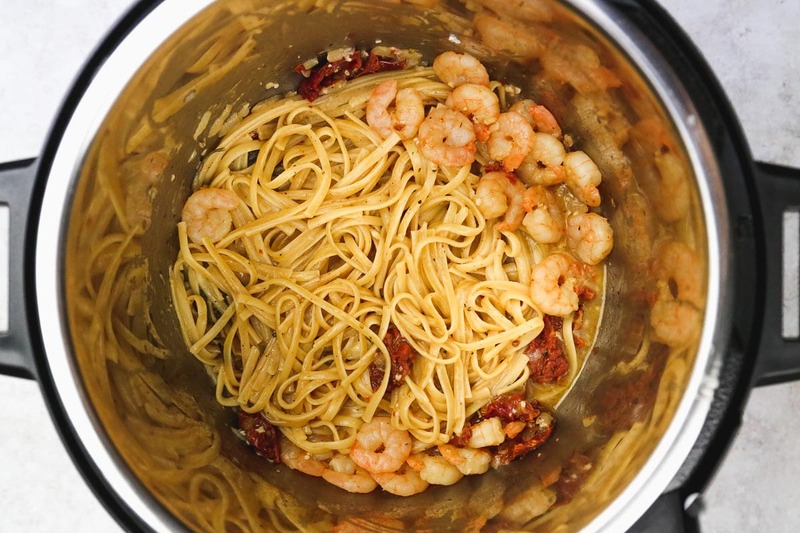 It makes cooking SO easy, I cooked this prawn or shrimp linguine is just 4 minutes, can you imagine? Make sure that your IP is in sealing position, and pressure cook for 4 minutes if you like al dente pasta or 5 minutes for softer pasta. You must use frozen shrimps for this recipe to work, as cooking fresh shrimps for that long can result in rubbery shrimps. If you only have fresh shrimps available, then cook the pasta for 2-3 minutes of high pressure and do a quick release. Add the shrimps, seal again and pressure cook for 2 more minutes then do a quick release and serve. Make sure that the pasta is covered with liquid before you start cooking. If at the end of the cooking, you feel like there’s too much liquid. That’s ok as that works as the sauce and it thickens as the pasta cools down a little with the help of the starch from the pasta. The best thing about this recipe is that you don’t need to drain the pasta, and everything is cooked in one pot! I hope that you will give this shrimp pasta a try. 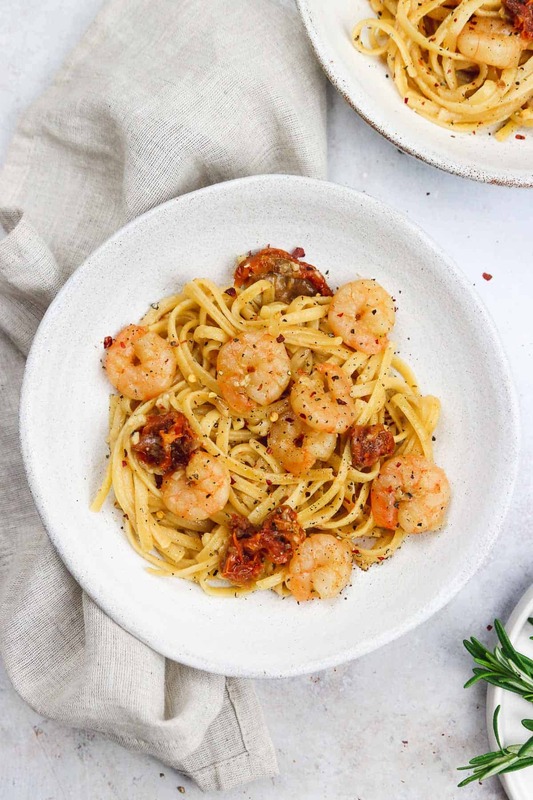 If you make this prawn linguine pasta, please don’t forget to rate this recipe and share a picture on social media. Tag #LittleSunnyKitchen in your posts as I would really love to see your creations! 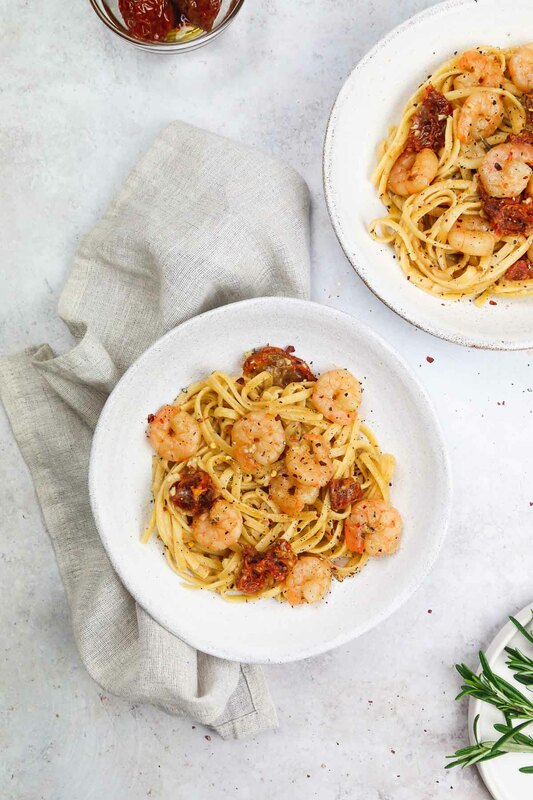 This easy prawn linguine pasta is so easy to make and comes together in as little as 20 minutes. Meanwhile, melt butter in a frying pan and toss garlic with chilli until garlic is fragrant. Add white wine and cook until reduced by 1/3, about 1 minute. Add prawns, and cook for a few minutes while stirring regularly until they turn pink. Add cherry tomatoes, and cook for a couple of more minutes. Drain pasta, and toss in prawn mixture. Season with salt, black pepper, and rosemary or basil if using. Serve immediately. Set your Instant Pot to "Saute medium", melt the butter and saute the garlic and sundried tomatoes. Add wine, and cook until reduced by 1/3. Add pasta, if it's too long to fit into the pot, then break it in half. Add frozen shrimps/prawns, vegetable stock and seasoning. Using a spoon mix the ingredients to make sure that all the pasta is covered with liquid. Close the lid, make sure that your IP is sealed and cook on "high pressure" for 4 minutes for al dente pasta, and for 5 minutes for softer pasta. 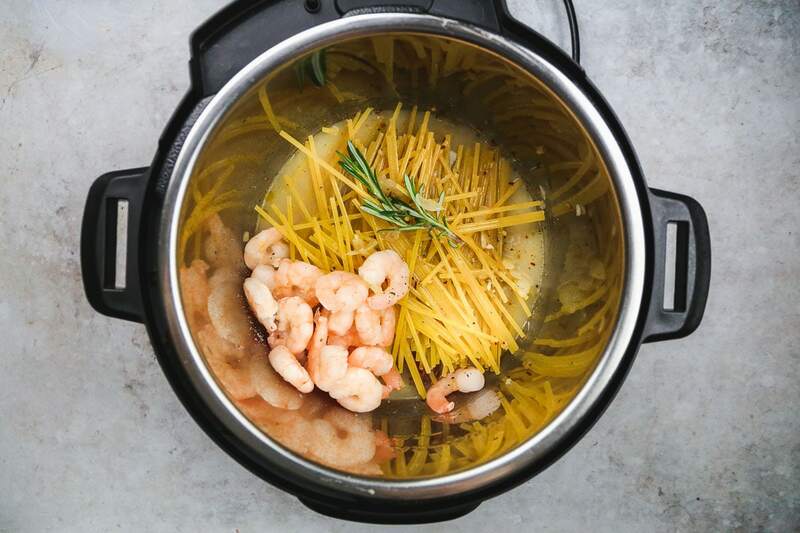 If cooking in the Instant Pot, the shrimps must be frozen. As cooking fresh prawns for that long can result in rubbery shrimps. If you only have fresh shrimps available, then cook the pasta for 2-3 minutes, then open the pressure cooker after doing a quick release. Add shrimps, then cook for 2 more minutes + QR. This recipe was first posted on March 20th, 2017. Then edited with new images and more information on December 1st 2018. This is my idea of heaven… We don’t eat enough seafood so this would be a sure hit here! Looks absolutely delicious! And it’s SO easy to make. Now no one can tell that eating healthy is too expensive … or complicated 🙂 Perfect weekday meal. This looks excellent. I love shrimp on pasta!! I especially like the garlic, wine and tomatoes! Yum, yum! I love prawns and tomatoes and this dish looks so tasty! Very flavorful to make the perfect meal.